APOCALYPSE REDUX San Francisco is what’s for dinner in del Toro’s monster movie. After I saw the teaser trailer for Pacific Rim, there was no summer movie I was less excited about. The computer-generated blur of giant robots battling giant monsters looked like a mashup of Battleship and the Transformers movies — a mammoth toy commercial. When I found out the director was Guillermo del Toro, cognitive dissonance set in. Not only is the Mexican-born filmmaker beloved by comics fans for his Hellboy films, but he’s combined genre thrills with wrenching drama in Pan’s Labyrinth and The Devil’s Backbone. Was del Toro selling out to make a Hollywood blockbuster, or could Pacific Rim actually be good? The answer is a bit of both — mainly the latter. Pacific Rim is indeed a big CGI smash-’em-up movie — a modern-day creature feature. But it’s also the movie Transformers should have been: silly without insulting our intelligence; and treating the lizard-brain appeal of a fight between humongous critters with the respect it deserves. Del Toro clearly loves the Japanese tradition of kaiju — giant, city-stomping monsters — as exemplified by the cinematic adventures of Godzilla, Gamera, Mothra, et al. 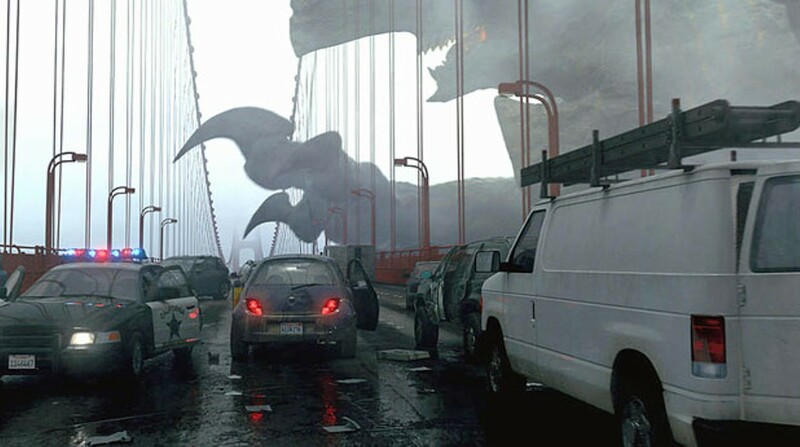 At the start of Pacific Rim, a vast claw emerges from the sea to grasp the Golden Gate Bridge; fog enshrouds most of the attack, leaving it to our imagination. A speedy opening sequence sets up the plot: One day in the near future, Kaiju (as they’re called in the film) start rising from an interdimensional rift in the Pacific and wreaking havoc on the shore. To save the world, our leaders unite and build Jaegers, giant robots controlled by a pair of human beings through a neural interface. One of these pilots is our hero, Raleigh (Charlie Hunnam), who’s commanded by a glowering Idris Elba, boasting the ridiculous name Stacker Pentecost. As the story begins, Raleigh’s latest mission ends in tragedy, grounding him for the next five years. It’s a pretty standard war-drama setup for the inevitable rematch with the monsters — and, of course, Raleigh’s redemption. Are we tired of watching cities get destroyed yet? I am. Yet two elements lift Pacific Rim above other cataclysm movies: the fleshed-out, colorful, often funny details of its world; and del Toro’s keen sense of scale. It’s not easy to give animated monsters a feeling of overwhelming, terrifying mass — we have to be tricked into seeing substance in pixels. Michael Bay-style editing turns the animations into a formless blur, and some of the fight scenes in Pacific Rim suffer from similar confusion. But del Toro finds ways to remind us how big these things are supposed to be: by shooting a tiny ship from the perspective of a Jaeger’s shoulder, or showing a flock of seagulls taking flight where a gigantic combatant crashes to the ground. The filmmakers also depart from the usual crisis-every-10-minutes blockbuster template to make fairly lengthy digressions into character development and world building. While Hunnam is bland and Elba is all bluster, Rinko Kikuchi of Babel supplies pathos as a would-be Jaeger pilot who lost her family to the Kaiju. Her English-language accent and acting are spotty, but her character’s flashback scene, in which we see Kaiju invasion from a child’s perspective, gives the movie an emotional anchor. A couple of outlandishly caricatured science dudes, played by Charlie Day and Burn Gorman, nearly steal the show with a subplot of their own. At times, Pacific Rim crosses the line from save-the-world solemnity into the campiness of Starship Troopers, and that’s not a bad thing. If moviegoers are shunning it because of blockbuster fatigue, they have a point — but they’re missing some fun. * Running time: 131 min.